It’s officially Day 3 of my June Whole30 and I am celebrating with a brand new recipe! 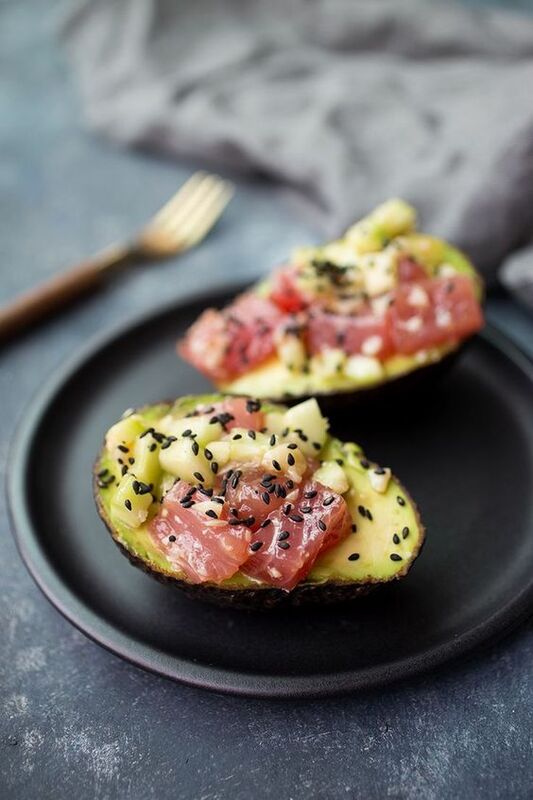 These Whole30-approved Tuna Poke Avocado Boats were inspired by my good friend Monica over at The Movement Menu. She has a Poke Boat recipe on her blog and it looked so tasty that I decided to make a Whole30 compliant version! 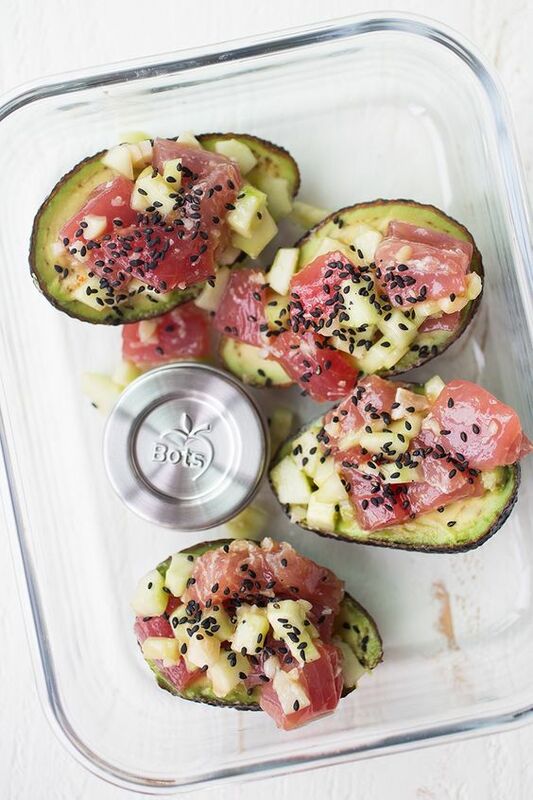 This recipe is really simple and uses only 6 ingredients (not including the avocado). The star of the show, in my opinion, are the coconut aminos. Coconut aminos are a delicious soy and tamari alternative that is made from the sap of coconut trees. Pretty cool, right? Truth be told… even if it weren’t for the Whole30, I would probably use coconut aminos for this recipe regardless. It is definitely slightly more sweet in flavor and I always bring it with me to sushi restaurants. In addition the coconut aminos called for in this recipe, I would definitely keep some extra on the side. 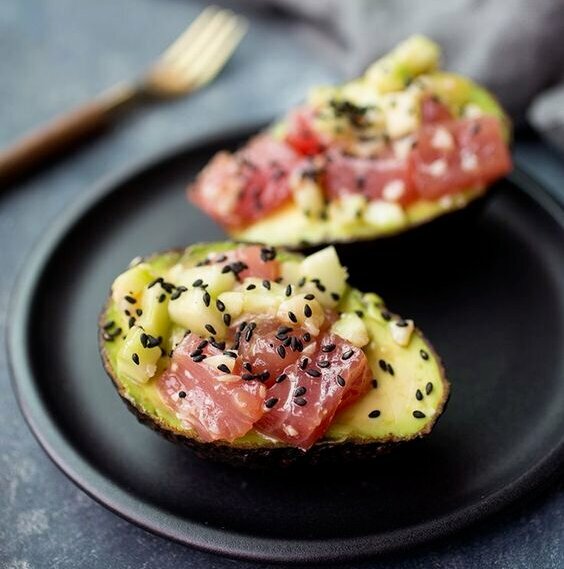 Once I’ve eaten most of the tuna out of the avocado, I like to pour a bit more coconut aminos into the avocado. So delicious! 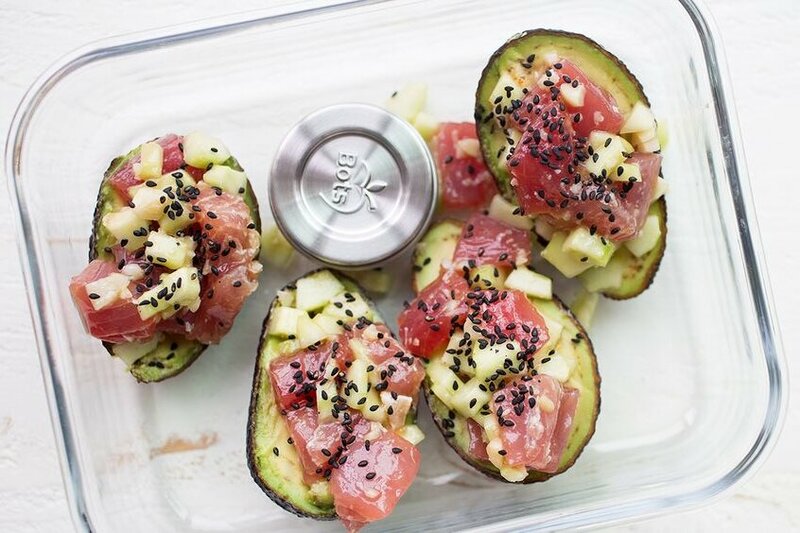 This recipe uses 1 pound of fresh tuna and yields 4 servings (two avocados per serving). If that’s too much for you or you want to make less, just cut the recipe by 1/2 or 1/4. This yield is perfect for my husband and I when we are doing a Whole30. Since snacking is discouraged on Whole30, big meals are a must. Two avocados might seem like a lot normally if you snack a lot, but I find it to be perfect for when you’re just doing 3 meals a day. This recipe is great to eat at home, but also to pack to go! I put a little bit of extra coconut aminos in a small Lunchbots container, and it’s good to go! But enough about that, let’s get to the recipe! In a large bowl, combine diced tuna, coconut aminos and toasted sesame oil and combine well. Place in the fridge while you chop the cucumber and macadamias to allow the fish to marinate a bit. Once the cucumber and nuts are chopped, add to the bowl with the tuna. If you don't plan on serving this right away, cover and keep fish in the fridge. 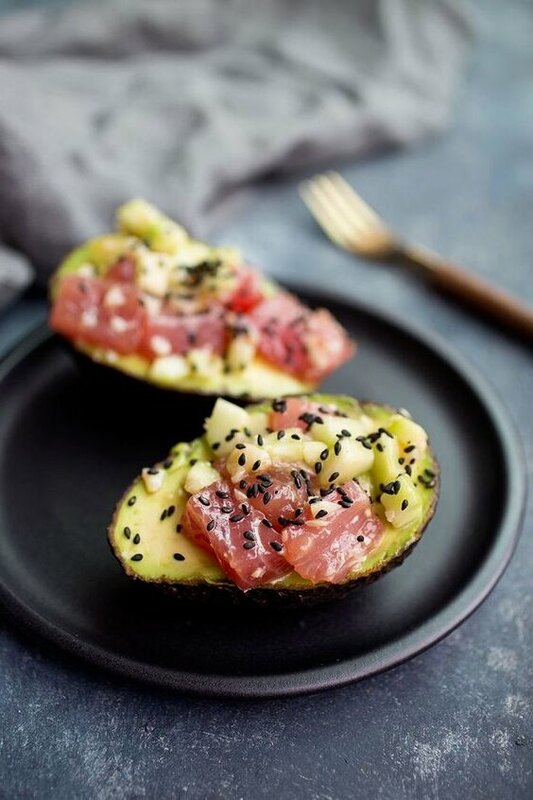 When you are ready to eat, halve two avocados and place a bit of the fish into the hole in the avocado. Top with a sprinkling of black sesame seeds. It is recommended that you eat the fish within 2 days as it's raw!